The Knights Templar have been the object of obsession of many a fantasy geek. This show takes a look at the 14th century and the Order's very last days. 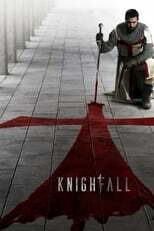 Where can you stream Knightfall? On 2017-12-06 Action & Adventure/Drama TV Series Knightfall first aired on History. Written and created by Don Handfield & Richard Rayner, and produced by Stillking Films & A+E Studios, Knightfall will return and was last broadcasted on 2019-04-15.